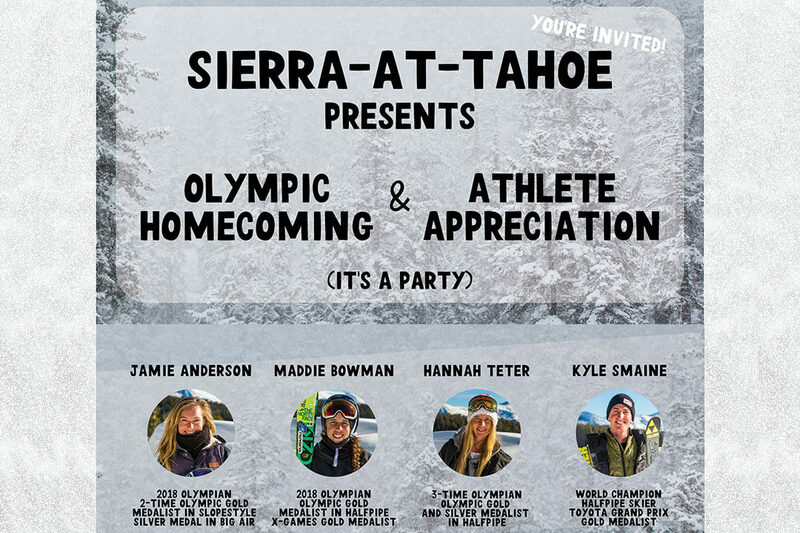 Sierra-at-Tahoe is proud to honor local winter sports athletes with a celebration at their home mountain on Saturday, April 7th. Jamie Anderson, Maddie Bowman, Hannah Teter and Kyle Smaine had undeniable success in the competitive year including bringing home Olympic Gold and Silver medals, World Championship titles and X Games Gold. The celebration will take place on the Solstice Plaza at Sierra’s base area and will include autograph signing, speeches by local dignitaries, a silent auction with proceeds going to Protect Our Winters and Jamie Anderson Foundation. Autographs will be available on the Solstice Plaza from 11:30-12p.m. Speeches will take place at 12:30p.m. and a silent auction with Olympic Memorabilia and donations will be held in the Solstice Eatery from 1-3p.m. Guests can enjoy live music on the Plaza plus great spring skiing all day long. This is a free celebration and includes athlete appearances by Jamie Anderson and Hannah Teter. Guests are encouraged to bring anything they’d like to have signed by the Olympians. Bummed it's after hours and that you can't hang with us longer? Awh we're flattered but don't be bummed...you still can! Join us weekly, every Thursday night at McP's downtown where Sierra tickets + gear will be given away as you break it down to the DJ! Bummed it's after hours and that you can't hang with us longer? Awh we're flattered but don't be bummed...you still can! Join us weekly at Applebee’s downtown for good food + bar games that have Sierra tickets + gear as prizes!